The growing trend in global warming has impacted the hydrological system of the Indus River system. 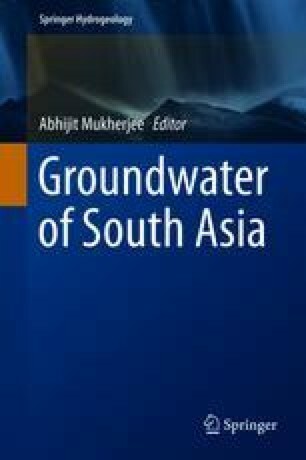 The variations in climate have influenced not only the local but also the regional behavior of groundwater system in the Indus River basin. It would also be crucial to investigate characteristics and behavior of this resource in order to ensure safe yield for irrigation, industry, and sustaining livelihood of millions of people of Indus area. A good knowledge of the problem and analysis of various components of the hydrological system are thus essential to achieve optimum groundwater management goals for sustaining agriculture development. The numerical groundwater flow model—Feflow—was calibrated to simulate groundwater flow behavior in upper Chaj Doab, Indus basin, during 1985–2005. The model had predicted an average decline of about 0.96 m in groundwater levels during the calibrated period and further reduction up to year 2020. A major breakthrough of groundwater depletion was observed in year 1999 when the last drought prevailed for over 3–4 years in this region. Major causative factors of watertable decline may include decrease in surface water for groundwater recharge, variability and change in rainfall pattern, and overexploitation of groundwater. The situation has resulted not only in exaggerating the cost of groundwater pumping, but also in abandoning existing wells. The integration of groundwater flow modeling and geoinformatic techniques proved helpful in analyzing the resource situation as well as vulnerability of the groundwater system to influential factors like climate change. As the country is already water stressed and predicted to face water scarcity in future, there is a need to monitor the groundwater system periodically on long-term basis to cope with food and water security issues in the Indus basin in future. We are thankful to the institutional support of Climate, Energy and Water Research Institute, National Agricultural Research Centre via projects (HIAWARE, ALP PARC) and Department of Earth Sciences, Quaid-i-Azam University, Islamabad, for execution of this work. The data support by Water and Power Development Authority (WAPDA), National Engineering Services Pakistan (NESPAK), Pakistan Meteorological Department (PMD), Pakistan Institute of Development Economics (PIDE), and Punjab Irrigation Department are also gratefully acknowledged.